The 2017 Honda Civic Si trim package puts more power under the hood, which is sure to please those who crave performance. You might remember the Civic from its early days in the 1970s when it was a small, economical car that helped you run errands around town. While it is still economical, the last body style change moved the Civic into the mid-sized class, and the addition of the turbocharger option gave it the power you need to do some serious driving. Because driving should be fun, Honda paired the inline-four turbo engine with a 6-speed manual transmission that makes you a participant in the driving experience. Instead of just being along for the ride, optional steering wheel mounted paddle shifters let you take total control of the gears you grab. Honda makes the 1.5 litre engine give you 205 horses to play with in the Si. This is the first turbo to go under the hood of the Si trim package and Honda did not stop at making it responsive; they also put a lot of engineering effort into making it agile with precision handling. You are going to love the way it hugs the road as you swing into sweeping curves. As you drive over the roads of Canada, you will need different transmission modes. You can choose between normal and sport modes. These modes make automatic adjustments to your adaptive suspension in order to find the right balance. It also controls the steering and the throttle response. The Drive by Wire Throttle System™ on the Civic Si regulates the throttle in order to provide you with the most efficient fuel consumption. The Agile Handling Assist sends signals to each wheel’s brakes and applies light brake pressure as needed while driving. The helical limited slip differential automatically adjusts the torque as needed to each wheel. Both features help you stay in contact with the pavement and improve stability. The rear spoiler improves the Civic’s aerodynamics, which adds to the stability and improves fuel efficiency. Since safety is always a consideration, Honda has equipped the Si with a number of advanced safety features that help make driving less stressful. As you know, you cannot control the other drivers on the road, but the 2017 Honda Civic Si can keep an eye on them for you. There are a number of safety features available for your Civic. Honda LaneWatch™ blind spot display can alert to when someone is lurking in your blind spot. There is a camera mounted under the passenger side mirror that sends a live stream video to your dash display. You can now see four times more than with just the side mirror. The available Forward Collision Warning system lets you know when you are too close to another car. If you ignore the audible alert, the Civic’s Collision Mitigating Braking System applies the brakes for you. This system is designed to brake firmly. Other warning systems include the Lane Departure Warning (LDW) and the Lane Keeping Assist (LKA) systems. Both are designed to keep you in your lane. If you have not signalled, the LDW will alert you to a shift in lanes. The LKA gently steers you back into your lane if you start to drift. Safety and performance are always key, but until you sit behind the wheel of this new 2017 or 2018 Honda Civic Si, you cannot fully appreciate how good the car feels sitting still or on the move. 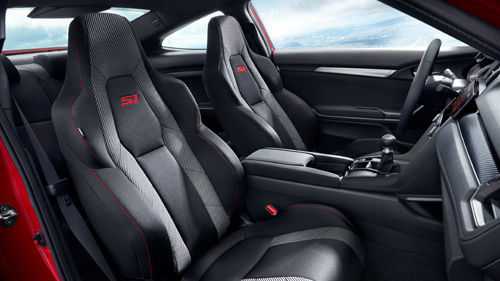 Stop by, and test drive the new Si today.